House owners all over the world have one thing in common – their properties require a lot of maintenance. However, with power tools like the Sun Joe pressure washers, the amount of time spent on that maintenance is decreased by a multifold. Surfaces like marble, granite, or wood tend to change over time. Sometimes it’s just dirt, other times its mold, but most probably it`s just the tooth of time. Whatever the reason is, pressure washers are usually the solution to restoring the fresh look of your yard. Sun Joe is a famous pressure washer manufacturer, especially when it comes to residential cleaning purposes. 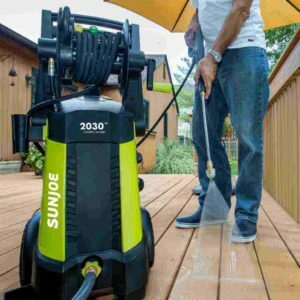 In the following section, we have prepared an unbiased Sun Joe pressure washer review of three best-selling models. We will analyze them on the field to see in what situations they excel, and to check for any shortcomings as well. The first model we are going to review is the best-selling one. Weighing just above 30 pounds, this model is proudly presented as the most versatile and mobile at the same time. 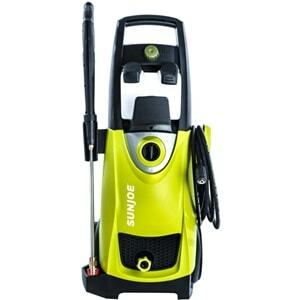 It`s an electric pressure washer that packs a 14.5 amp motor inside, and with the said power it can generate up to 2030 PSI with 1.76 Gallon Per Minute. This means that the total cleaning power score for this unit is 3573. What separates this model form the others is the option to pressure wash on a higher temperature (up to 104 degrees Fahrenheit). This is the best feature because even some industrial cleaners use just cold water. There are 5 different Quick-Connect spray tips for the nozzle at your disposal: 0-degree, 15-degree, 25-degree, 40-degree, and the one for the soap). The soap and other cleaning agents can go into 2 separate 30-ounce tanks, which are quite convenient if you want to mix your own detergents. Additionally, this pressure washer is equipped with a Total Stop System (TSS) that automatically shuts down the pump when you`re not holding the trigger. The whole body is mounted on 2 ergonomic wheels that make the movement a breeze. Next up we have a model that could be considered the older brother of the SPX3000. It has similar power performances when it comes to the engine: it is an electric pressure washer with a 14.5 Amp motor inside that generates 2030 PSI and has a 1.76 GPM rate. The cleaning power score is the same as with the previous unit – 3573. There are 5 types of additional nozzle spray tips (0, 15, 25, 40 degrees and a soap dispenser). This unit also has the TSS safety measure as well. However, this model operates only with cold water and packs a single, but 40.6-fluid ounce on-board detergent tank. A 20 feet long high-pressure hose is provided as well. Now, what separates this model from the previous one is the built-in hose reel. The reel is just there to make your life and cleaning easier. With a highly ergonomic design, it is specifically created for easier storage. This pressure washer is also designed to be a bit sleeker and weighs just a pound more than the previous model. Last but not least, we have the mid-range model. This unit is designed for slightly lighter and less complicated cleaning jobs. 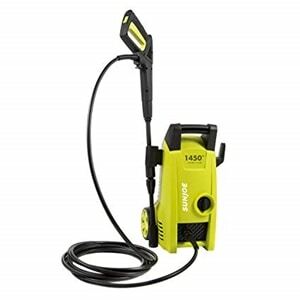 This pressure washer provides a maximum of 1450 PSI and 1.45 GPM with its 11.5-Amp electric motor, and it weighs significantly less – just 11.7 pounds. The total cleaning power score is 2102. This unit belongs to more compact and easily transported models. It’s quite easy to handle and carry around, and you can cover large areas with the cord length of 35 feet. With the adjustable spray wand and a twist-nozzle you can easily access any unreachable stains that you want gone – but only with cold water. The Sun Joe company mainly promotes this product for `light to medium duty cleaning jobs` around your house, and they recommend it to be used as a quite practical and ergonomic car washer. And if you don`t feel like carrying it around, there are 2 plastic wheels attached to it. This model packs a punch if you count in the size-to-power ratio, but it is not able to clean the hardest and harshest of stains like the models we described above. Even though relatively young, as a brand for winter maintenance power tools, have easily conquered the market. This successful manufacturer of various tools for residential cleaning purposes was founded in 2004. The company gives off a modern vibe with its witty advertising and even its motto: Go with Joe, Snow or Sun, smart tools that get the job done! But do not let that approach fool you, the company manufactures and specializes in developing innovative outdoor tools and they divide it into 2 groups: Snow Joe for autumn and winter, and Sun Joe for spring and summer cleaning. The work around the house and maintenance have never been easier and more affordable. This system proved to be a quite efficient being that the company is a worldwide competitor and has built a stable business that just keeps expanding in the competition with the brands that we have mentioned on our homepage. Sun Joe constantly tries to deliver new types of products for all price ranges. They even participate in patent design competitions, proving that competitive spirit is a valuable asset to have in today’s market. They even won the Amazon Gold Award for the most innovative product in 2017. Getting in touch with the customers seems to be a big deal to Sun/Snow Joe. The company looks pretty invested in getting all the feedback possible and is publicly open about it. They promise that they have a tool for every outdoor need you might have. They offer free shipping for purchases over $75, and they offer a package tracking service if you decide to order online. Lastly, the company offers a 2-year warranty on any purchase you make, and they are proud and loud about it. Plus, you can easily get spare parts for any of their products quite easily. As you might have noticed, all of the Sun Joe pressure washer models we talked about earlier are powered by an electric motor. That is no coincidence. This company is actively trying to stand side by side and rival the manufacturers of gas-powered power tools and garden equipment. Being that it actually is a competitive field of power tools, going in with the eco-friendly solutions is a challenge this company successfully withstands since the beginning. They deliver on the promise of rivaling the performance of gas-guzzling counterparts without all the fuel, fumes or fuss, as it is emphasized on their website. These can be some of the most successful pressure washers but they are not too big on power, as you might have concluded with the `no gasoline` part. But, they carry more ergonomic solutions than the competition and certainly are lighter than them. Also, having the smell of gasoline in your backyard is sometimes a deal-breaker. They may not go to an abnormal power level, but are easier to handle and are more mobile which enables you better maneuvering. In the end, it’s all about your cleaning tasks. Electric models from Sun Joe are great for all residential cleaning purposes like deck maintenance, washing your car, cleaning patios and garden furniture, window washing, and similar light to medium duty jobs. This brand feels modern and up-to-date, without having the masculine visual identity. If you want to go for a greener option, with a bit less power, Sun Joe is the pressure washer for you. They have a good customer support team and offer a solid service when it comes to online shopping. 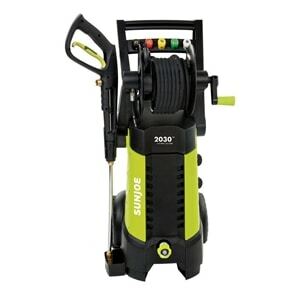 We have included all the specifications about the products in our detailed Sun Joe pressure washer review. With this information, you can easily make the purchase decision. It all comes to this: if you prefer working around the house with non-gasoline-powered, lightweight and generally environmentally friendly equipment, this would be the ideal pressure washer for you. After all, think about the cleaning you want to do – do you really need that much power? The two-year warranty gives you enough breathing room. You can focus on pressure washing, without worrying about whether you made the right purchase. The company even produces multiple types of detergents to make your cleaning jobs more efficient. To quote the Sun Joe company: you name it, you aim it, grime is gone. © 2018-2019 Pressure Washer Lab. All Rights Reserved. pressurewasherlab.com is a participant in the Amazon Services LLC Associates Program, an affiliate advertising program designed to provide a means for sites to earn advertising fees by advertising and linking to amazon.com.